My brother was coming in to fix the busted taillight on my Mom's car. Long story. I won't get into that. Since my brother doesn't get in very often, my Mom wanted to have a nice lunch. She had in mind to have grilled steaks. Since she is not a griller (gasp), I offered to man the grill. She'd cover the side dishes, and that's terrific if you're doing the outdoor cooking. Food Lion was out of tenderloin which is what my Mom planned to get. That's a wonderful cut of steak but quite expensive. My Dad got a full loin once for my birthday and had it cut thick. The checker called for a price check when it ran around $100 for one grocery bag of high quality meat. The other cut of steaks that my Mom was familiar with was Rib Eye steaks. She knows I generally get those. Rib eyes are large, tender with lots of flavor. Some folks call them guy steaks. Lots of meat. No bone (though are sometimes sold bone in). I have boys, so I usually go with rib eyes. It takes a lot to fill boys up, and they like lots of flavor. Well, Food Lion didn't have any nice looking rib eyes either. This rather stressed my Mom. I must introduce her to the Food Lion meat man. I ring his bell pretty often, and he enjoys helping me pick out good stuff in my budget. One tip he gave me was that I could buy Chuck Eye cheaper. That's just the ends where they cut Rib Eye. Cost per pound is lower. Pieces are smaller. I just get two per boy if I go that route. That kind of left Mom in a bind, the steaks she knows sold out, so she bought New York Strip. Another good pick for grilling. I think maybe the package said "good for grilling" or something. New York Strips are sold under various names and are called different depending on the area. Some names that come to mind are Texas Strip and Restaurant Cut Steak. The meat is from the back area where the cow does not use the muscles much, so the meat is tender. There's usually a little sliver of bone up one side - not a t shape bone. If it's in a t-shape, that's t-bone steak. 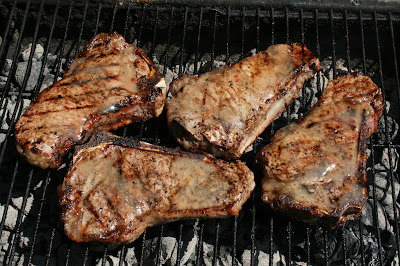 T-bones are good for grilling as well but a little less expensive (in this area anyway) and a little harder to eat with the shape of the bone. Another solid cut is Porterhouse. It includes some loin on one side. It's kind of a cross cut steak. You get two cuts in one with a bone dividing the meat. Some people like the extra flavor with a bone in steak. I tend to go with boneless. That's the tenderlion and rib eye usually. Both are well marbled and have plenty of flavor especially if you can find grass fed beef. If price is an issue (and steak is costly), some of the lower priced cuts can be grilled. They are a little trickier. Sirloin is an example. It's OK on the grill, but if you overcook it with the lower fat content, it's tough. You generally need to cook it fast and hot and no more then medium. Round steak or a London Broil (which is not an actual cut and may be various parts of the cow), look pretty in the packs. They are red and show very little fat, since they do not have much marbling. Those really need to be grilled rare and cut against the grain in thin strips. They work if you want a taco grill party but are not super served up as steak on the plate with baked potatoes and salad. That's a quick overview of some different steak cuts on the grill. I do love tenderlion but most often go with Rib Eye at a lower price but still premium. I do NY Strip and Porterhouse from time to time. When we bust the budget I'll go with some of the cheaper cuts but usually served sliced thin and cooked less. I also marinate longer to tenderize if I do round steak or London Broil. As far as our dinner, the New York Strips turned out great. I could have cooked them just a little less. I was on my Dad's old cast iron grill which cooks hotter and faster than my Weber. The steaks leaned to medium well. No complaints though. It is possible to ruin a steak on a grill (and I've done that a very few times), but usually you have a great meal when you go with steaks grilled over charcoal. I hope this provides a basic overview of steaks to cook on the grill. I am working on a more comprehensive and detailed article for my web site - Yes You Can Grill. Any suggestions, comments or ideas are appreciated.